Timothy Bradley kept his WBO light welter title last night at Mohegan Sun Casino in Uncasville, CT after challenger Nate Campbell claimed he couldn't see after suffering a serious laceration above his left eye at the end of the third round. The bout was entertaining during its short duration with Campbell looking to press the action and wear down the champion through a strategy of energy-sapping clinches, wrestling and short shots on the inside. The much quicker Bradley wasn't playing along however, and threw punches in bunches, forcing Campbell to cover up and go defensive for much of the time. Seasoned vet Campbell made Bradley miss or largely nullified the effects of what did land by riding the shots but as each moment passed, the champion looked to be gaining more control of the bout. The 25 year old champion was far more fluid in his movements than his 37 year old rival and the strength advantage enjoyed by the naturally larger Bradley also looked to be causing Campbell problems. By the third, Bradley had Campbell on the ropes and was throwing all he had into the assaults. Near the end of the frame, an accidental clash of heads occurred shortly before Campbell backed away and motioned to the referee that he was cut just as the third round ended. In his corner, Campbell announced repeatedly that he could not see from the injured eye and the bout was stopped. 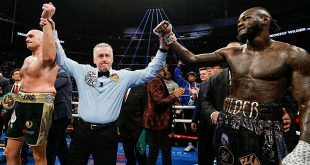 Campbell's cut was ruled to have come from a punch and a stoppage victory for Bradley was announced, infuriating Campbell, who maintained that he was cut by the head clash and a no-decision should have been the verdict. Timothy Bradley improves to 25-0 (12) while retaining the WBO belt and Nate Campbell drops to 33-6-1 (25). 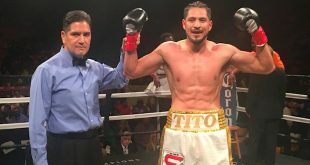 There will likely be a rematch due to the controversial ending of the bout. 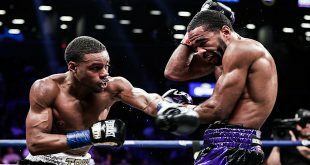 On the undercard, another light welter, Devon Alexander, had a much clearer path to victory as he forced Junior Witter to quit on his stool after eight rounds to capture the vacant WBC title. As in the Bradley vs. Campbell clash, this contest appeared to be all about age differential as the 22 year old prospect Alexander was much faster of foot and hand than former WBC beltholder Witter. Although inexperienced at top level, Alexander showed he belonged, rattling off lightning quick two-handed combinations that Witter struggled to cope with. After eight largely one-sided rounds, Witter declared an injured elbow suffered earlier in the bout and didn't come out for the ninth.